Dodge the incoming in this sound created environment. Turn sound on for full effect. Move using the arrow keys. Steer clear of all spikes, blocks, and comets. You have four lives, each represented by the segments of your body. If you all lives are gone, you lose. You will get an extra 200 points for each segment you still have at the end ofthe game. 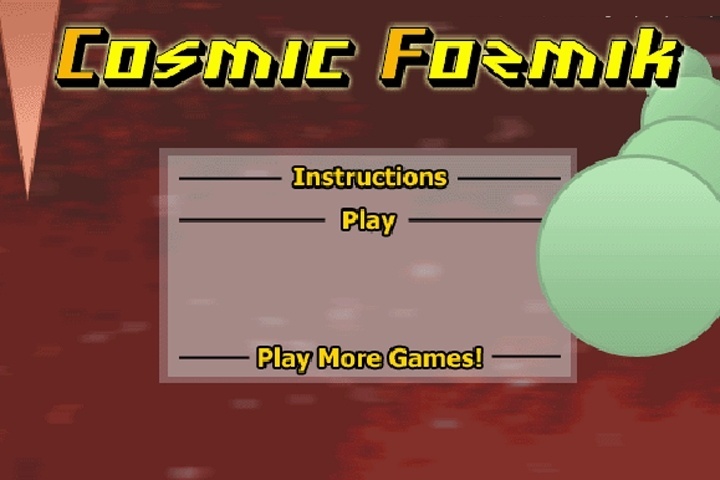 If you want to play Cosmic Formik games online you have come to the right place! GamesLoon adds new Cosmic Formik games every week. This is your game portal where you can find the biggest collection of free Cosmic Formik games online. Do not forget to rate our Cosmic Formik free online games while playing!